March 19, 2018, Adrian, Michigan – Trust, awareness of the interconnection of people and all of creation, collaboration, equality, listening, and patience are among the keys to forming and maintaining resilient communities. Those were some common threads of five national thought leaders who gave presentations March 12 to a full house in the Weber Center Auditorium. Adrian Dominican Sisters, Associates, and community members from the Adrian area gathered to explore this topic of increasing interest in the world today. Sister Patricia Siemen, OP, Prioress, speaks during an afternoon break-out session. The five speakers were: Nick Tilsen, a citizen of the Oglala Lakota Nation and Executive Director of the Thunder Valley Community Development Corporation; Janie Barrera, founding President and CEO of LiftFund, the largest nonprofit micro- and small-business lender in the United States; Rev. 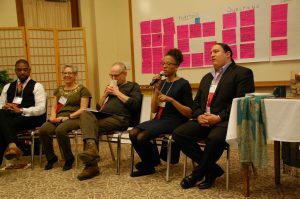 Starsky Wilson, President and CEO of the Deaconess Foundation and head of the Ferguson Commission; Ahmina Maxey, U.S. and Canada Regional Coordinator with the Global Alliance for Incinerator Alternatives (GAIA); and Michael Rozyne, founder and “evangelist” of Red Tomato, a regional food hub based in Plainville, Massachusetts. Participants, packed in the Weber Center Auditorium, discuss the presentation by Nick Tilsen. Resilient communities have been an important focus for the Adrian Dominican Sisters as a way to live out one of the four Enactments from its 2016 General Chapter: “We pledge our lives, money, and other resources to facilitate and participate in creating resilient communities with people who are relegated to the margins, valuing their faith, wisdom, and creativity.” The event was organized by the newly formed Resilient Communities Office, directed by Dee Joyner, an Adrian Dominican Associate. 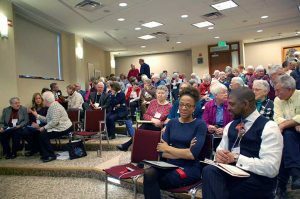 In their individual talks and in a concluding panel discussion facilitated by Jim Hauden of Root, Inc., the five thought leaders provided key findings and advice for the Adrian Dominican Sisters and others seeking to build resilient communities. ♦ Be inclusive, involving in discussions and decision-making everybody who will be affected by the decision. Rev. Starsky Wilson, in his talk on “Resilience through a Racial Equity Lens,” spoke of diversity in decision-making, “bringing people with a unique perspective to the decision-making table.” In this sense of inclusion, he said, all participants share power and focus on an outcome that benefits everyone. In her talk on “Environmental Justice and the New Economy,” Ahmina Maxey noted what happens when people who are affected are left out of the decision-making process. She cited a study that showed that toxic waste is more likely to be placed near communities of people of color or people in poverty. ♦ Be collaborative. “The future is impossible to predict,” said Michael Rozyne. “Our own experience is not enough,” he added. Those who organize resilient communities need to learn from and work with other people and organizations that have expertise to share. He gave the example of his own work with the United Farm Workers and Costco. He brought the two groups together, focusing on improving the working conditions of the farm workers with increased pay from Costco. Janie Barrera noted that she works closely with the economic development departments and chambers of commerce in cities to get the word out about their products. “We don’t have a big marketing department,” she said, so LiftFund relies on these local organizations to spread the word about its services. She added that LiftFund also forms “solid partnerships” with the people who receive their loans, using the money that their clients pay back to offer loans to others in turn. ♦ Engage in an open dialogue. “Listen before you speak – but speak indeed,” Rev. Wilson advised. He gave an example from his experience as head of the Ferguson Commission, which studied the issues involved in the shooting by police of Michael Brown, Jr., in Ferguson, Missouri. In the middle of a community meeting, he said, the people were angry with the Commission. “We had to get away from the table and listen,” he said. Michael Rozyne spoke of the need to find common ground in dialogues, particularly in deeper, core values. “We just need to see the difference between core values and surface values,” focusing on those deeper, core values, he said. ♦ Engage in “one-planet thinking.” Nick Tilsen noted that everything is connected – people, all of creation, and the planet. “In every development decision we make, we make sure [it’s] good for the people and planet and gives prosperity for all people.” Because everything is interconnected, he said, all that is affected by a decision needs to be taken into account. ♦ Educate those who need it. To build resilient communities, people who are less advantaged may need to be educated and nurtured to play their full role. Ahmina recalled working with Destiny Watford and a group of high school students in the Baltimore, Maryland, area as they fought against an incinerator that was to be built in their neighborhood. “They reached out to us and we gave them some training,” she said. The students did research, discovered that the incinerator would emit mercury and lead, and appealed to their school board. Because of their efforts, the incinerator was never built. Speaking during the closing panel discussion are, from left: Rev. Starsky Wilson, Janie Barrera, Michael Rozyne, Ahmina Maxey, and Nick Tilsen. 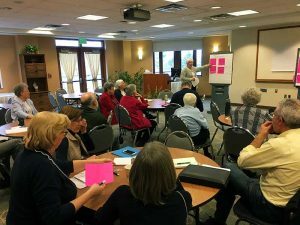 The Congregation’s Resilient Communities Committee – and the resilient community committees for local areas of Sisters and Associates – will glean the information and ideas to use in their work.